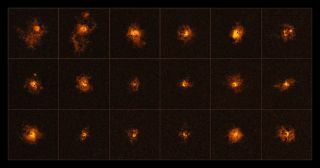 A mosaic of 18 of the 19 quasars observed using the European Southern Observatory's Very Large Telescope. The survey revealed that all 19 quasars had bright halos. Gas halos around distant galaxies are colder and more common than previously believed, a new study suggests. The finding could force astronomers to rethink some of their theories about galaxy formation. Researchers examined 19 quasars, or galaxies with very active supermassive black holes at their centers, using the European Southern Observatory's Very Large Telescope (VLT) in Chile. You can see a video of the quasar halos here. Quasar black holes eat huge amounts of nearby material, such as gas and stars, very quickly, causing the galaxy centers to blast out large amounts of radiation. This makes quasars the most luminous objects in the universe. "It is still too early to say if this is due to our new observational technique or if there is something peculiar about the quasars in our sample," study lead author Elena Borisova, an astrophysics professor at ETH Zurich in Switzerland, said in a statement, referring to the group's use of a relatively new instrument on the VLT called MUSE (Multi-Unit Spectroscopic Explorer). "So there is still a lot to learn; we are just at the beginning of a new era of discoveries," Borisova added. The survey held another surprise as well: The newly studied halos have temperatures of around 18,000 degrees Fahrenheit (10,000 degrees Celsius). "This revelation is in strong disagreement with currently accepted models of the structure and formation of galaxies, which suggest that gas in such close proximity to galaxies should have temperatures upwards of a million degrees [Celsius; 1.8 million degrees F]," European Southern Observatory representatives said in the same statement. A paper based on the research will appear in the Astrophysical Journal.